Craig Siska's original interest was in the esoteric teachings of Edgar Cayce. When in 1978 he went out to visit the Cayce headquarters, he asked about any work that was being done in the area of agriculture. The people there referred him to the activities of Paul Soloman, a self-styled guru who had recently established a spiritually-oriented farming community located near the town of New Market, in the Shenandoah Valley of Virginia. Upon arriving there and declaring himself interested in working in the gardens, he was introduced to Alan Chadwick and told by the community leaders to "Do whatever he tells you to do." Alan Chadwick working in the garden at Virginia. In the course of time, Craig began to drop by Alan's cottage in the evenings after the day's work in the garden was done, and there ensued a series of conversations on various subjects. 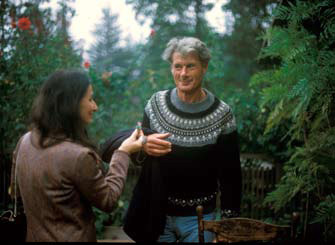 They discussed Steiner's biodynamic preparations, for example. Alan explained that he did not use them because he did not want people to believe that the productivity of his gardens was the result of using "potions." At Craig's request, they also discussed methods for communing with the "elementals." Alan suggested that he sit outside for a whole night in silence during a heavy rainstorm -- which Craig did. It is unclear if he happened to see any sylphs, undines, or salamanders that night! After Alan's death, Siska began collecting tapes of lectures that Alan had delivered in various locations. At one point, after an unfortunate series of family tragedies, Craig himself became seriously ill. Unsure about whether he would successfully recover his health, he gave his collection of Chadwick tapes (about 250 of them) to a close friend named Steve Crimi. He asked Steve to carry on the work of collecting the Chadwick tapes and eventually publishing them so that more people could experience something of Alan's message. Despite Craig's severe illness at that time, he has since recovered and is now working with Steve Crimi on a project they call the Alan Chadwick Archive. Their stated goal is to create an internet resource that will allow interested researchers to directly access these lectures and other materials related to Alan's life and work. In the meantime, they are transcribing and publishing some of Alan's lectures in book form. The first of these is titled, Performance in the Garden, and the second, Reverence, Obedience and the Invisible in the Garden, both of which are reviewed elsewhere on this site. They also are selling transcripts of a lecture Alan gave on bees, as well as his Saratoga lectures (1972) in CD format. We at Alan-Chadwick.org are often asked, "Who is Craig Siska?" Not many former apprentices from California know him because he was not involved at Santa Cruz, Green Gulch, Saratoga, or Covelo, Alan's principle teaching gardens in the USA. One of our collaborators, Peter Jorris, met Craig in the Fall of 2012 at a gathering held at the home of Paul Lee in Santa Cruz, and was favorably impressed. Since early 2012 Craig has contributed a number of photographs and other items to this website, including his digital files of the Saratoga lectures, which saved us the work and expense of converting our old audio tapes -- for which we are grateful. On the other hand, Craig has declined to provide us with many other items that we have requested. The stated reason is that they want to wait until everything is ready, transcribed, edited, audio and visually remastered, etc., before they make the material generally available. They will also need to raise large sums of money in order to make all this possible, which could further delay the date at which the archives become accessible -- and this could be years. While we approve of any efforts to collect and preserve Alan's legacy, we do not like the idea of any group monopolizing material and keeping it from other researchers. Craig and Steve have solicited original documents, tapes, photographs and other items from their owners and then refused to make them available to others. For more than thirty years Craig has had the intention of sharing this material with the world, and we are still waiting. Our recommendation to anyone who is considering making a donation of Alan Chadwick materials to Craig's project is to give copies only, or, if giving original documents, at least to save copies so that other researchers can have access to them in the meantime. We also recommend that Craig and Steve make all materials available now, and that they continue the process of editing and remastering and transcribing so that they can finally present everything in the best, most pristine format possible. This will be a great service to humanity and we applaud their efforts in that direction. But to keep these resources to themselves in the meantime is the opposite of a service; it only serves to deprive the world of a much-needed source of information and inspiration. Craig was interviewed by Allan Balliett, moderator at Biodynamics Now! (bdnow.org), a website that provides podcasts on the general subject of traditional biodynamics and Rudolf Steiner's approach to agriculture. Craig speaks about his time in Virginia working with Alan Chadwick in the garden there. As many of our readers have expressed curiosity about the Virginia project, we include here a link to that interview.